CELEBRATE 40 YEARS OF STONE BLUE! Foghat are truly a gift to rock music & boogie band enthusiasts worldwide. The nucleus of the quartet were originally from the British blues powerhouse Savoy Brown, and left to form their own trail blazing band in 1972. In 1978, "Stone Blue" was a huge hit for the band, thanks to number of smash tracks and stellar blues interpretations that have been considered some of their finest material ever. Kicking things off with the hard rockin’ slide guitar infused "Stone Blue" followed by Bo Diddley’s classic "Chevrolet", a fine reading of Elmore James’ "It Hurts Me Too" & Robert Johnson’s "Sweet Home Chicago", the Lp was truly a home run. Friday Music is pleased to announce The Foghat /Friday Music 180 Gram Audiophile Vinyl Series with the 40th Anniversary Edition of their masterpiece "Stone Blue." The Lp is mastered impeccably by Joe Reagoso and will be manufactured for a limited time on stunning translucent blue audiophile vinyl, presented in a striking gatefold cover, with new liners from co-founder Roger Earl and the late Craig MacGregor. Foghat are truly a worldwide gift to rock music and boogie band enthusiasts everywhere. The nucleus of the band (Dave Peverett, Roger Earl, Tone Stevens) were originally from the British blues powerhouse Savoy Brown, and left to form their own trail blazing band in 1972, and rock music and their millions of fans have never been the same since. In 1978, Foghat were now enjoying the benefits of super stardom after years on the road and having consistently successful radio and chart success. Stone Blue was another huge hit for the band, and brought them even further success thanks to multiple amount of smash tracks and stellar blues interpretations that have been considered some of their finest material ever. Kicking things off with the hard rockin’ Stone Blue, this slide guitar champion truly takes the listener into a classic rock journey complete with all the great twists and turns you would expect from this superstar outfit. Check out the stunning blues interpretations of Bo Diddley’s classic Chevrolet, the perfect reading of Elmore James’ It Hurts Me Too, and of course the Foghat smash version of Robert Johnson’s Sweet Home Chicago. Lonesome Dave Peverett continues his winning streak with a handful of newer fare with the powerful Easy Money, complete with an incredible drum workout by his old Savoy Brown bandmate Roger Earl, locking in step with the stunning lead guitar of Rod Price and the great Craig MacGregor on heavy duty bass. These pioneers of the British blues/rock scene carry on with more masterful workouts on hit album tracks like Midnight Madness, High On Love and their inspiring power ballad Stay With Me, making Stone Blue the revered masterpiece that it still is today. Friday Music is no stranger to the music of the gold & platinum rockers Foghat, therefore we are so excited to announce our first installment in The Foghat /Friday Music 180 Gram Audiophile Vinyl Series with the 40th Anniversary Edition of their legendary masterpiece Stone Blue. The original Bearsville Records Lp is mastered impeccably by Joe Reagoso (Jeff Beck, Johnny Winter, Deep Purple) and will be manufactured for a limited time on stunning translucent blue audiophile vinyl. 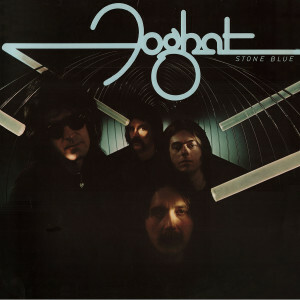 To celebrate four decades of Foghat’s Stone Blue, we further enhance this limited anniversary edition with a first time gatefold cover featuring the original artwork elements as well as rare gatefold featuring photos from the band’s archives, as well as new commentary from co-founder and drummer Roger Earl.